One young woman in her early twenties, Ms. S, came in complaining of lifelong severe stomach cramps and diarrhea. I diagnosed IBS and gave her my “fiber talk.” I started her on Citrucel, and her bowels promptly shut down. Within a week or so, she went from severe diarrhea to moderate constipation. After finding MiraLax an improvement over Milk of Magnesia, she sent me a card saying, “This is the best my health has been that I can ever remember.” She now only takes the MiraLax if she gets into trouble, usually on one of her long road trips, and she is still following the fiber program. I used to think that young folks would adapt fairly quickly once they embraced the program. In Ms. S’s case it took several months before she began to note major improvements, even though she was following my instructions to a T. But because she was on almost weekly major road trips, her travel schedule may have offset what we were trying to achieve in the bathroom. I urged her to slow her travel schedule down and to be proactive-reminding her to step up on the laxatives before she got into the car or else shortly after she arrived at her destination. “Don’t wait and let everything shut down,” I reminded her. In this chapter, the many different faces of constipation are unmasked. 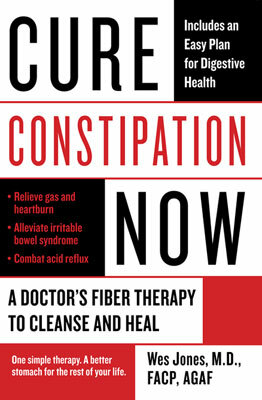 Once you learn to recognize constipation for what it is, then you have a handle on how to best take care of yourself. But also know that although constipation is the culprit, abdominal gas is one of its chief henchmen by which so much havoc is wreaked on our society. In fact, gas problems have been estimated to afflict up to 20 percent of our adult society, and I believe that even this figure greatly underestimates the extent of the problem, especially because you don’t have to feel gassy to have gas problems, just as you don’t have to feel constipated to be constipated. The surprise to many people is that they don’t even realize that they have an issue with either gas or constipation. And if you don’t know you have a problem, then you haven’t a chance of managing it. The problems are compounded when one realizes that most doctors (including most stomach specialists) don’t understand how to treat their patients’ gas problems and the fact that over-the-counter remedies and medicines are more hype than help. Managing gas problems is more than avoiding certain foods or taking a medicine. What works and doesn’t work for gas and what foods to avoid and why are discussed in this chapter. If you have stomach pain and all your lab results and X-rays are negative, chances are good that gas is the problem. Follow your health care provider’s advice about getting yourself checked out, but in the meantime, it may be a good idea to follow the three-step fiber therapy program (see Chapter 3). If an obstruction is ruled out, the fiber plan will most likely help ease or even resolve your problems. If you have a noisy stomach, frequent belching, reflux, irritable bowel syndrome (IBS), explosive and/or persistent diarrhea, and even halitosis (bad breath), chances are good that gas problems are at least contributing to if not causing your problems. You came to the right place for help. I worked as a GI recovery nurse when I first met Dr. Jones. Every time he came to discharge a patient and gave his “fiber talk,” I would say to myself, “Oh boy, here he goes again with that crazy talk about fiber.” I thought he was seriously a bit “out there,” if you know what I mean. That was back in 1993. Meanwhile, I went through many years of suffering from reflux and constipation, because I was not smart enough to buy into the “fiber talk” that Dr. Jones prescribed. I took Prilosec and Nexium as often as twice a day (I tried them all), and yet I continued to have severe reflux. I often woke up at night coughing and choking, sometimes wheezing, and even having problems breathing. I used to smoke, so I thought some of my problems might be due to chronic bronchitis. I even saw a cardiologist and had a heart catherization [in which dye is injected into the arteries of the heart to see if there is a blockage) because nothing was helping my reflux. Both my heart study and endoscopy exams were fine. It seemed that I was just going to have to learn to live with my reflux problem. Ten years later, I again began working in the GI lab and I became reacquainted with that same Dr. Jones. This time I worked in the procedure room rather than in recovery as before, and I saw how he really cared. Not all doctors do, you know. His sincerity impressed me, and this time I really listened more carefully to what he had to say. His “fiber talk” finally sank in, and now I wish I had listened ten years ago. My life has changed dramatically. I no longer take Prilosec or Nexium, and I no longer have any reflux symptoms or wake up at night coughing and choking. I have regular bowel habits and feel so much better now that I finally decided to smarten up and listen to the doctor whom I had once thought to be a “crazy man.” I thank God for granting me the wisdom to listen to what Dr. Jones had to say and for allowing me to act on it. I feel like a new person. Americans are stuck with among the worst digestive processes because constipation is the most under-diagnosed and poorly managed illness of the modern era. Indeed, reflux, IBS, indigestion and gas are all ailments that often get their start from unrecognized and poorly treated constipation. Crohn’s, ulcerative colitis, sprue and diverticulosis are likewise frequently mismanaged since constipation is seldom considered as part of the illness. This book also explains why the most common forms of cancer and even Alzheimer’s disease may possibly be delayed in onset or prevented entirely with a high quality fiber diet.